Uncategorized | preciousandmakeup.org || it's just a beauty thing. Strip Lashes – These lashes come two in a pair and come in a variety of lengths, thickness, colors, etc. Separate Flares – These lashes are the half versions of the strip lashes. They are applied to the outer edge. Individual Lashes – These lashes come in two varieties : regular or clusters. These are the most natural looking out of all the lashes and create a more fuller look for your natural lashes. When applying individuals, you have to apply one lash or cluster at a time. When applying individual/cluster lashes, you need to use individual eyelash adhesive. This adhesive secures the lashes for up to 6 weeks if taken care of properly. When applying strip or flares, you need to use a regular eyelash adhesive such as DUO. Duo adhesive is a great brand to use because when using this adhesive on my lashes, they stay on securely without lifting at the edges by the end of the day. This tutorial is by far my favorite for false eyelashes. Complete with pictures and detailed step by step’s. Do not tug on the lashes. If you do, chances are you might be pulling off your real lashes too. That’s never a good thing. You can invest in false eyelash/make up remover or you can simply use olive oil or virgin coconut oil to loosen up the lashes. Apply false eyelashes after doing your eye make up. Use mascara before and after applying the false eyelashes to blend into your natural lashes. If you plan on wearing eyeliner, use an eyeliner that doesn’t smudge easily or simply opt to using liquid eyeliner or using an dampen thin liner brush + eyeshadow. The last thing you want is smudged up eyeliner after applying your eyelashes. False eyelashes too big? Just cut a little bit of the lashes on the inner edge to best fit your eye shape. If your wearing a lot of eye make up and want to wear false eyelashes, use natural looking lashes like Ardell’s #109 (one of my personal favorites: pictures here & here of the look). Don’t feel like wearing mascara, but feel like you need to wear something? Use Ardell’s #305 flare lashes paired up with a black winged out eyeliner for lazy make up days (one of my new favorite looks + lashes). Practice makes perfect! Practice applying lashes on during your free time to get hang of false eyelashes and to see which lashes best fits your eyes. Remember ladies: Stock up on lashes, you can NEVER have too many! Who doesn’t want to look great in pictures? Here’s some of my tips for photo friendly make up. Use a primer. The last thing you want to worry about is runny/melted off make up during a ‘photoshoot’, so using a foundation & eye primer is a must. Avoid wearing foundations with SPF. The flash from the camera reflects the SPF in the foundation making you look pale/ashy in pictures. Don’t forget to powder! Avoid looking oily in your pictures by applying a loose powder after your foundation. Don’t OVER do your make up. You always want to wear a little more make up than you usually would to make sure it shows up on film. Don’t over do it to the point you look too made up and artificial. Matte finish eyeshadows look best in pictures. 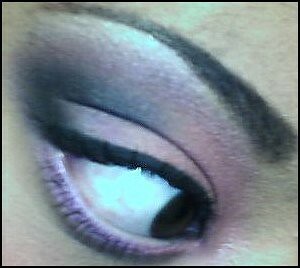 If you do wear shimmery eyeshadows and want to cut the shimmery-ness of the look, apply a matte eyeshadow to the crease. Lower lashline : Milani Color Brilliance Purple eye pencil as a base, MAC Violet pigment on outer lashline, and NYX Prune eyeshadow on inner lashline. I’ve been in such a colorful mood lately that I’ve been doing this yellow & red eyeshadow look for the past few days now. It’s now my current favorite look. I finally got my hands on some NYX eyeshadows this past week and they are the eyeshadow I used in this look. 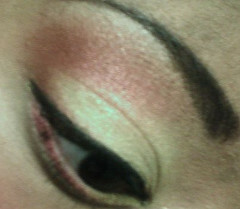 1) First, apply an eyeshadow base to the lid, passed the crease, and on the browbone. 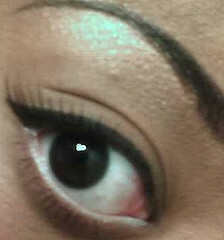 I used this time Ulta Eye Primer (review coming soon). Apply a shimmery light yellow/light gold eyeshadow to the lid and just the inner crease. I used NYX’s Blondie eyeshadow for the light yellow. 2) Apply a shimmery red eyeshadow on the outer crease and just on the outer corner of the lid. I used NYX’s Rust eyeshadow for the red eyeshadow. 3) Apply a shimmery light beige on the browbone for the highlighter color. Use an eyeshadow primer on the lower lashline and apply the yellow on the inner lashline/red on the outer lashline. 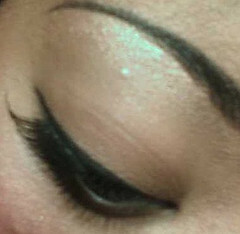 4) Apply black eyeliner on the top lashline. I used Wet n Wild Megaliner Liquid eyeliner in Black. Lastly, I apply a few coats of Artistry Essentials mascara in Black & Artistry Waterproof mascara in Black for a false eyelash look.